Asus announced two widescreen LCD monitor with 1680×1050 resolution. 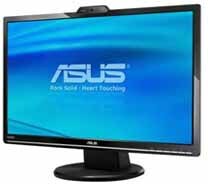 These LCD monitors adopt Splendid Video Intelligence technology and offer 1,920 x 1,080 resolution, 20,000:1 contrast ratio, 16:9 aspect ratio, a 1.3MP webcam and a HDMI slot. More variants will be announced at the end of this month. For more information, visit http://www.asus.com.